Share the post "New Jersey’s Got “Terroir,” Celebrates State Wine Week Sept. 19-28"
The winemakers’ art relies on the cultivation of select varieties of well-adapted grapes that thrive under sets of conditions unique to every site. The French have a single vocabulary word, “terroir,” to describe this broad set of interacting factors that includes the soils, their orientation, grape variety, farming practices, climate, local microclimate, wine making culture and technology. According to the New Jersey Department of Agriculture, New Jersey has 50 licensed wineries and is 10th in the nation in wine production, with 1.6 million gallons produced in 2012. In 2013, New Jersey wineries sold 447,425 gallons of wine. New Jersey Gov. Chris Christie honored the wine industry for being a growing contributor to the state’s economy, signing a proclamation declaring September 19 to 28 as New Jersey Wine Week. Rutgers New Jersey Agricultural Experiment Station (NJAES) has a key role in supporting the state’s wine grape industry. Launched in 2014, the New Jersey Center for Wine Research and Education (NJCWRE) is a new partnership between industry and academia being developed by Rutgers NJAES to establish and support a comprehensive and interdisciplinary program of research and education in response to the needs of the wine industry of New Jersey. The center will accomplish this by understanding and responding to the needs of the industry in areas such as varietal selection, viticultural methods, disease and pest management, production methods, economic analysis and business model implementation. 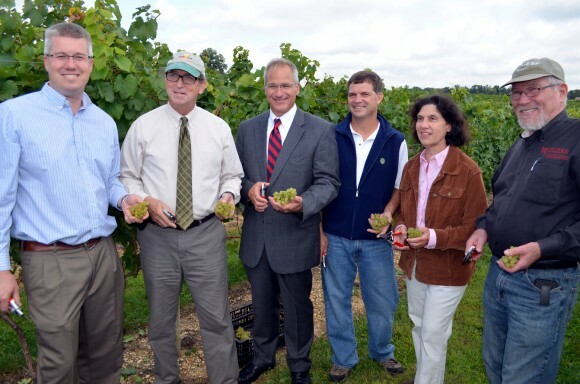 “The opportunities for the wine industry in New Jersey are immense, and the NJCWRE is dedicated to helping the industry meet this potential,” added Hillman. To celebrate New Jersey Wine Week, many New Jersey wineries have activities that extend into the fall and holiday season. For a listing of New Jersey wineries, visit the Jersey Fresh website.